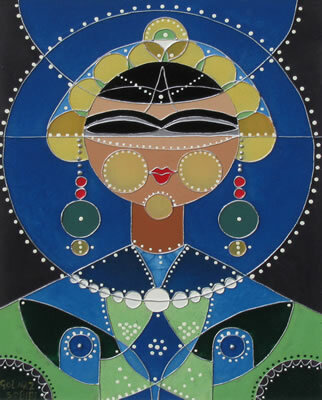 Golnaz is a Persian artist and the only known artist in the United States who employs the vitray method of glass painting that she learned from the masters. Golnaz studied for two years with master Persian artists Mr. Taeb and Iraj Javanshir. Golnaz makes her own paste for the traditional vitray process and mixes her own colors. The results are the rich, deep colors associated with stained glass artists combined with the classic designs of Persian architecture that come alive in the paintings of Golnaz, who now lives in Woodland Hills, California.